We were just as dismayed as you were to hear the news that SIGG bottles manufactured prior to August 2008 contained BPA. If you previously owned a SIGG bottle and need a new hydration sidekick, or you’re new to this market and are shopping for a BPA free reusable bottle for yourself or your kids, we have taken away the guesswork by compiling a list of our top five picks for safe, stylish non-toxic water bottles for kids. *Most come in adult sizes too! CamelBak makes two specific kid minded water bottles. According to Sally McCoy, CamelBak CEO, both are 100% BPA free. McCoy notes, “I want to be very clear about what we mean when we say “BPA-Free” – it means there is no BPA in our materials, and thus no BPA in the liquids that people drink from our bottles.” The new CamelBak Kids’ Bottle is made with from a copolyester polymer called Tritan, made by the Eastman Company. Tritan is 100% BPA-free and phthalate-free, but comes with the durability and stain-resistance you want in a child’s water bottle. The Kids’ Stainless Bottle is made from stainless steel, which is leach free, stain-resistant, corrosion-resistant and taste-free. The Kids’ Bottle cap on both bottles is made primarily from food-grade polypropylene while the Bite Valve is constructed with medical grade silicone. The straw is made of polyethylene, the same material used in milk bottles and all of the lid components are BPA free. The Kid Kanteen Classic is “vastly superior to aluminum and plastic bottles.” The proof of this claim is in the material which comprises Klean Kanteens: 18/18 food grade stainless steel, which contains no harmful chemicals or toxins. Cap & spouts are made of BPA-free polypropylene (pp#5). 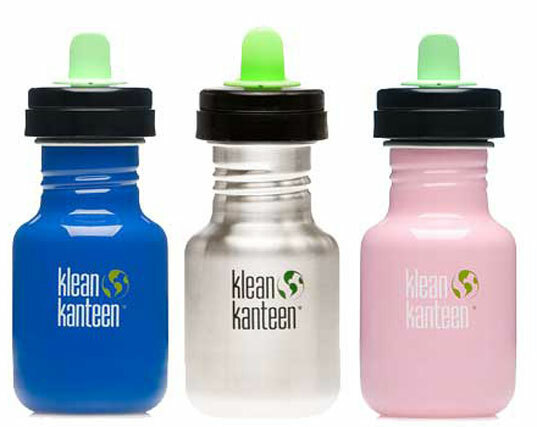 The curved corners and the rounded threads on Kid Kanteen bottles make them easy to clean and sanitary. Each bottle is built to last a lifetime, and while they are extremely sturdy, they are lightweight and easy for toddlers to hold. No chemicals or weird tastes will leach into water or juice in these bottles, and they are 100% recyclable. We’ve previously written about the ME-ME sippy cup, which is made out of food grade stainless steel and #5 polypropylene. As contributing Inhabitots writer Jasmin reported, Innate’s 7.5 oz. ME-ME Stainless Steel Sippy Cup won’t corrode, rust, or leach toxic chemicals like bisphenol-A and phthalates. She adds, the ME-ME is designed as a modular system that adapts to your growing child’s needs, with removable handles and a lid you can swap out for a pop-top or drip guard. The stylish no-spill helpers come in two versions (with or without the rubberized grip) and your choice of three colors (Gurly Pink, Puff Blue, and Whirled Peas Green). From one of our favorite makers of BPA free baby mealtime dishes and safe non-toxic baby bottles comes the Thinksport stainless steel water bottle. This is a reusable bottle that’s great for both kids and parents. (Beth takes hers everywhere!) It comes in two sizes; a 12 oz size perfect for kids ages eight and up, and a 750 ml size which is great for older, extra thirsty kids or adults. This completely BPA free water bottle is a double walled, vacuum sealed stainless steel bottle with a polypropylene drinking spout. It’s double wall system keeps cold drinks chilly for hours. 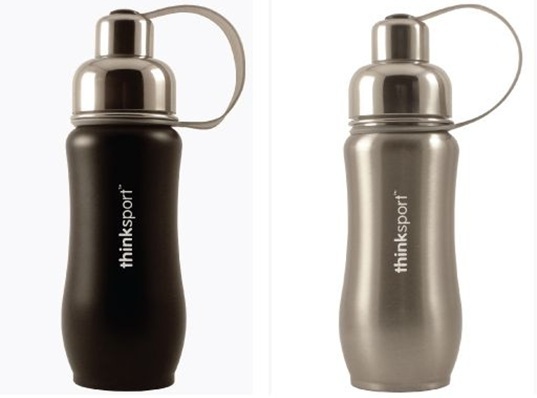 Thinksport bottles come in silver or black only; no flashy colors and designs. But the style is sleek and shiny – and many kids like the look of stainless steel because they can decorate it with stickers. EarthLust bottles are the most stylish water bottles for design savvy kids… or for kids with design savvy parents. 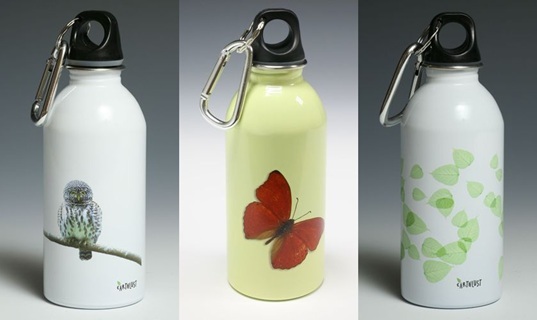 These 13 oz water bottles are also made of food grade stainless steel. BPA-free safe polypropylene #5 is used for the caps. Best of all, each EarthLust water bottle is a work of art. Each features a custom design, many of which are limited editions. Designs are printed with non-toxic paints. While the 13 oz size is perfect for little sippers, an older child could choose one of EarthLust’s equally intriguing 20 oz water bottles. Are any of them not made in China? May we add that bottles that filter out contaminants and remove chemicals like fluoride might be even better - even if they don't have cute pictures on them? To your health and that of the planet. www.friendsofwater.com. Are there any water bottles not made in China? What about Europe? I bought a SIGG to get away from plastic, and here they are containing pba in their liner. They lied about it because they had a confidentiality agreement with their chinese manufacturers! That is terrible! I would prefer to buy local, CA, but would just settle for US! I know this article is basically a year old now, but if you're looking for BPA-free watter bottles made in the USA, check out Nalgene. 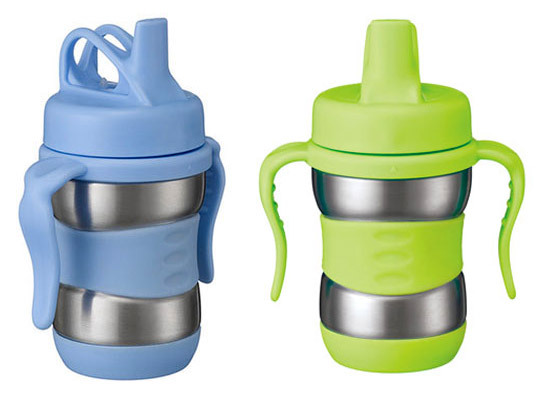 They're made with the same BPA-free Eastman Tritan material as the Camelback bottles. Unfortunately Nalgene doesn't really offer any good kids' bottles though -- the closest thing they have is a handle-less sippy bottle (which my son didn't like at all). For on the go with smaller kids, the best thing we've found are the Camelback bottles with the flip-up bit valve. Our two kids both love them. Liberty bottles makes stainless bottles in the USA. Kids are our wealth and future. Let's make them eco conscious and responsible for their health. There's a really special new product in UK called Flaska. It's a 500ml glass water bottle that has sicentific information imprinted into the glass. This information restructures water and makes it softer and smoother and what's more important: it reduces level of genotoxic chemicals by 45%. It's available on http://www.flaska.co.uk. I'm the client of tappiebottiglie. I buy Tritan bottles from tappiebottiglie in Italy, that's light, Clear, and easy to bring up, every step of make it up is made on respect of workers rights. no china. In my opinion the best stainless toddler bottle is not even listed - the Pura Kiki bottle which to my understanding is the only bottle that is completely free of plastic. We have six of them for my kids and absolutely love them! Are they guaranteed to be 100% racioactive-free, these Made in China metal bottles? We were just as dismayed as you were to hear the news that SIGG bottles manufactured prior to August 2008 contained BPA. If you previously owned a SIGG bottle and need a new hydration sidekick, or you're new to this market and are shopping for a BPA free reusable bottle for yourself or your kids, we have taken away the guesswork by compiling a list of our top five picks for safe, stylish non-toxic water bottles for kids. *Most come in adult sizes too!